So if you browsed carefully through our 2011 Dog Show Awards Catalog, you may have noticed we slipped a few new non-traditional prizes into the mix. 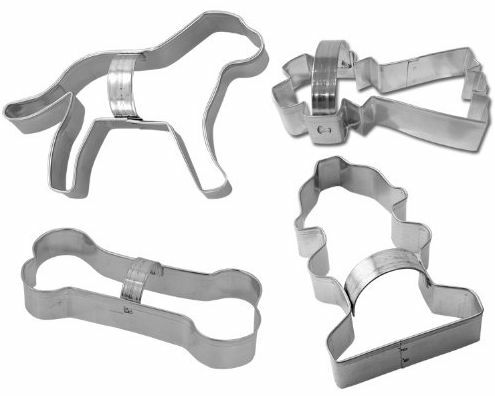 In addition to our obedience and agility frames, silver, and new whistles, are a selection of dog-themed cookie cutters. And keeping with the tradition of our equestrian cookie cutters, the shapes come with a cookie recipe. Anyone who looks for recipes online knows there are plenty of dog cookie recipes to choose from. Do you want to use liver, bacon, cheese, jerky bits, yogurt, peanut butter, or another central ingredient? Well, to make sure the recipe was simple enough, and would get your dog salivating, we had to test the recipes. 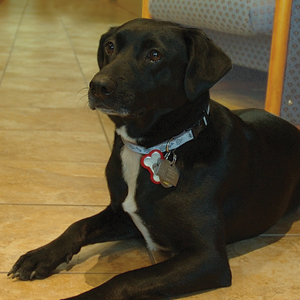 Our President Volunteer Baker Rick Hodges was happy to test them out on McKell, our company dog-in-residence. It turns out the yogurt recipe burned too easily, and the bacon recipe didn’t look too good after it sat in the jar for two days. Rick said that there was no way he was putting raw liver into his blender! So we stuck with the dog-approved classic peanut butter. While McKell “really would rather just lick peanut butter straight from the jar,” apparently she thinks the cookies are pretty good too. This entry was posted in Hodges Badge Company and tagged dog cookie cutters, dog show awards, dog treat recipes, hodges badge. Bookmark the permalink. ← We’re Having a Rosette Sale- 3W is Back!